I am going to proceed to prove and document that if you are a Democrat, you are a demon-possessed fool of the most depraved sort imaginable. The Los Angeles Times did a major investigative article on June 26, 2016. It describes just one bloody month – in other words, just a typical month in our world today – of April in which there wasn’t a single day in which there was not a deadly terrorist attack somewhere in the world. Interestingly, in this article a chart is featured labeling each group responsible for an attack and the number of casualties. The groups dominating the top were Islamic State which killed 395 people, the Taliban, which killed 109, Boko Haram, which killed 68, Shabab, which killed 41, the Syrian rebels, who killed 23, Abu SAyyaf, which killed 19. You have to really get into the WEEDS before you find a group that isn’t officially ISLAMIC. NINETY-FIVE PERCENT of the murders committed by terrorists groups in this month were committed by MUSLIM GROUPS. More than 800 people were butchered by Muslims claiming Allah and claiming Islamic theology as their primary motivating force to do what they do. You cannot keep believing these Democrat Party lies that Islam and terrorism have no legitimate connection or relationship. Of course, the Los Angles Times, being leftist propaganda drivel, doesn’t point that rather important fact out to you. Nope. You’ve got to look up the terrorist groups yourself, find out their ideology and do the tallies and then do the math. Other than the Indian Maoists, the Kurdistan Workers Party (communist), the Lord’s Resistance Army, Renamo, the New People’s Army (communist), and the New Irish Republican Army, they’ll all MUSLIM. And these other terrorist groups are chicken feed compared to the real terrorist monsters who are murdering hundreds at a time. Obama has boasted and boasted and boasted about his “fifty nation coalition.” It’s a joke. So Obama and Hillary are out there dishonestly claiming that Islamic terrorism isn’t “Islamic” and that Muslims are our friends. And they’re just lying right out of their anuses they call their mouths. Muslims are OVERWHELMINGLY responsible for the vicious terrorism and they can’t even tell us who our enemy is. And meanwhile they dishonestly pretending that we have allies that we very clearly do not have. 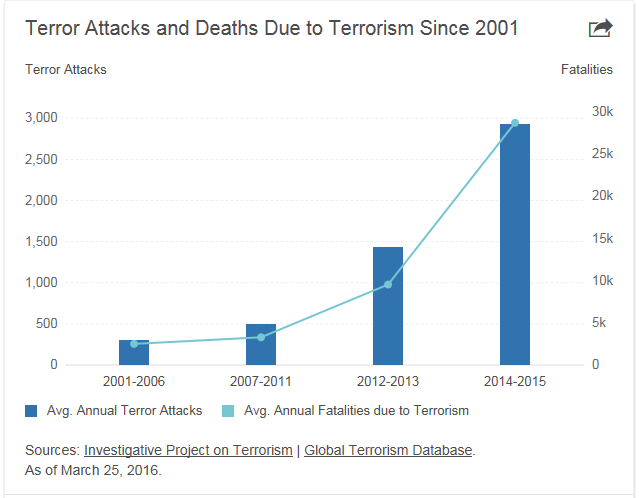 Terrorism has doubled exponentially every single two year period while Obama has dishonestly claimed he’s been winning and succeeding. The human race has never witnessed anything like this. This is not merely “failure,” this is DEMONIC FAILURE. But THE most dishonest media – even making Joseph Goebbels’ Ministry of Propaganda in the days of Nazi Germany and the TASS of the Soviet days look honest in comparison – are NOT telling the story and they are intentionally NOT connecting the dots so that people can see that Obama has failed them, failed America, failed the world, failed the entire human SPECIES. Democrats and liberal Muslim contextualizers will stand there and tell us that most of the victims of terrorism are Muslims. And that’s actually true. But what does it prove? Nothing, when Muslims have been the primary murderers of Muslims since Islam split into the two warring factions of Sunni and Shia at the moment that Muhammad died. The Day of Ashura was a day of massacre in which the followers who became Sunnis massacred the grandson of Muhammad and his companions. That violence has continued ever since. During the Iran-Iraq War, more than a million Muslims were murdered by Muslims. This notion that Muslims are somehow victims because the terrorists who murder also murder Muslims is a great big fat giant fraud. Muslims will murder anyone they can murder and do so quite gleefully. You cannot keep believing these Democrat Party lies that Obama has succeeded or that Hillary Clinton will succeed. On the same day they did their study of the 180 attacks committed in April, the same Los Angeles Times published news of new major attacks on page A4, including a story about Muslim gunmen from Shabab murdering 14 people in Somalia and the Muslim-created “catastrophic humanitarian emergency” for Nigerians. Tens out thousands of people have fled and are literally starving to death because – as the LA Times notes – “Violence in northern Nigeria fueled by the Islamic extremist group Boko Haram, has forced more than 2.5 million people to flee their homes, according to United Nations statistics.” Those murders weren’t included in the big story titled “Diary of Terror” that the LA Times featured on the main page without every once singling out Islam for the vicious religion that it is. Dhaka: The attackers involved in the Dhaka restaurant siege had asked their victims to recite from the Quran before deciding on whom to spare, a leading Bangladeshi daily said on its website on Saturday. “Those who could recite a verse from the Quran were spared, others were tortured,” the Daily Star quoted a rescued hostage as saying. At least 20 foreigners, including an Indian, were killed in the 10-hour siege at the Holey Artisan Bakery in the diplomatic enclave of the Bangladeshi capital. The siege ended after the Bangladeshi security forces gunned down six of the attackers and captured one of their associates. Those who could not recite from the Quran were tortured by the gunmen, said Rezaul Karim, father of Hasnat Karim who was held hostage for over 10 hours. Sounds exactly like something any card-carrying “religion of peace, charity and justice” would do, right, Barry Hussein??? Ah, yes, the religion of peace is so peaceful when everyone who would say anything to argue is DEAD. But there, I recited the evil, hateful, vile, demonic Qur’an for you Muslim murderers, so let me go. I welcome the Los Angeles Times to do a follow-up story over the months of June and July and see how Islam is faring in it’s Obamaesque version as “the religion of peace, charity and justice.” And it’s quite a marvelous thing to listen to our Muslim-in-Chief praise Muhammad and his Islam while he insults Jesus Christ and His Christianity. But then again, Obama actually said “my Muslim faith” and had to be officially corrected as to what his faith was supposed to be according to his previous dishonest blatherings about being a Christian. I’ll give this to Obama: he isn’t any less Christian than Lucifer. Or any more Christian, either. In a previous article, I go into rather great detail comparing the Qur’an to the Holy Bible in terms of commandments to violence. It’s not that hard, folks. The Old Testament of the Holy Bible predates Islam by something on the order of 4,000 years. By the time Muhammad had written the Qur’an, Jesus had appeared some six centuries previous – in fulfillment of the Old Testament prophets to fulfill Judaism – and Jesus taught peace as the Prince of Peace. He told His followers to put away their swords and allowed Himself to be taken and tortured and crucified to death by violent, evil men. Not exactly the path that Muhammad took when he took part in over thirty military campaigns of conquest, committed multiple acts of genocide, and had another thirty more planned at the time of his death. Which by the way was the result of being poisoned by a Jewish woman vengeful over yet another murderous attack against Jews in which he killed the men and enslaved the women and children. Jesus prophesied His own death; Muhammad turned out to be not so good at it. But Jesus also prophesied that He would – as God’s powerful Son – be raised from the dead in proof of His deity and His divine message. “The Prophet” really failed miserably at pulling off that feat. I simply cannot stand it when an Obama or a Hillary Clinton or a CAIR representative or some other leftist Islamist contextualizer makes the ridiculous statement that “whoever did this terrible deed is not a true follower of Islam.” Because I would just like to ask that fool one simple question: “Okay, do you think that the Prophet Muhammad was ‘a true follower of Islam’?” Because it is a simple matter of history to document that the Prophet did all the same damn things that Obama and the leftist Muslim contextualizers today say is so against the teachings of Islam. You can tell me that according to Islam killing and committing acts of genocide against your enemies is a good thing; but what you CANNOT tell me is that Muhammad didn’t do those things. Because it is simply a fact of history that he did. I keep hearing this insane crap about the Muslim terrorist murder of homosexuals and how tolerant Muhammad supposedly was to homosexuals according to these idiotic liberal contextualizers of Islam. And so they’ll mindlessly quote Sura 5:32 that says, “the killing of an innocent life is like the killing of all mankind, the saving of an innocent life is the saving of all mankind.” And yeah, Muhammad said that: WHEN HE WAS IN MECCA AND HE WAS THE UNDERDOG. He said a lot of sweet stuff then when his adversaries were far more powerful than he was. But when he went to Medina and became the strong man, the gates of hell opened. And those liberal contextualizers of Islam refuse to quote the vicious stuff Muhammad wrote at the end of his life that according to Islam’s doctrine of abrogation supplants the sweet nice stuff he wrote early when he was afraid of his enemies. The Qur’an and Islams other accepted holy sources actually are quite explicit how Islam should deal with homosexuals. And it aint nice. If Muhammad said two things that appear to be contradictory, you must heed the last command he gave. And he did that a LOT, by the way. There are a whole BUNCH of what I call “convenient suras” in which Muhammad contradicted something he had previously said in order to justify getting something he wanted. And in the case of the history of Muhammad and the Islam he created, there is simply no question: when Muhammad started out in Medina, he was the underdog and even his own tribe refused to follow him and he preached during this phase peace and tolerance and co-existence. Until he reached Medina and gained power and began to teach the violent subjugation of his enemies. Liberals completely fail to comprehend this: the Bible begins with violence and moves to peace. Not so the Qur’an. Not so Muhammad. When you read a Qur’an, understand that “Muhammad was like two different persons at two different times and the Quran is like two contradictory books pasted together.” Understand that in Islam you have 1390 Years of Violence and only 10 years of Peace. When Mohammad first began to proselytize his new religion in Mecca and claim that he was receiving revelations from Allah, he was decidedly the underdog. And correspondingly all of his revelations centered around peaceful coexistence and tolerance. But then Mohammad went to Medina in what is today called “Al Hijra.” He was able to garner followers and became militarily powerful. And suddenly all of the revelations of his Qur’an took a decidedly violent turn. The Qur’an was NOT organized in any kind of chronological order; rather, it was organized by length, from the longest to the shortest suras. When you re-arrange the Qur’an by chronology, you get this order: and you get not violence to peace as the Holy Bible gives, but peace to VIOLENCE. So, for example, do your own research. Consider the very first violent Sura 2:191-193 found in the Qur’an which states, “And kill them wherever you find them, and turn them out from where they have turned you out. And Al-Fitnah [disbelief or unrest] is worse than killing… but if they desist, then lo! Allah is forgiving and merciful. And fight them until there is no more Fitnah [disbelief and worshipping of others along with Allah] and worship is for Allah alone. But if they cease, let there be no transgression except against Az-Zalimun (the polytheists, and wrong-doers, etc.)”. And lo and behold, when you examine the chronological order and look to the right column to see where it was organized according to the tradition based on length of sura, you find that this edict found in Sura 2 to “kill them wherever you may find them” is the VERY FIRST sura Mohammad conveniently claimed he received from Allah when he arrived in Medina and became the dominant power. This is not merely a command for violence; it is a UNIVERSAL COMMAND for violence. I’ll talk about that more. Keep going down the list of violent suras and look at where they are found, whether they were written earlier in Mohammad’s Mecca phase or later when he arrived at Medina and became militarily powerful. You will find that without any question, the vast overwhelming majority of violent sura that commanded violence and death were given in Medina just as the vast overwhelming majority of suras commanding any kind of “peace” was given in Mecca. A simple historic statement of fact: Mohammad and the Qur’an takes us from peace to viciousness and hate and murder and death and slaughter. Now, this is bad, but it actually gets WORSE. Because Islam has a doctrine called “abrogation” by which later suras correct and supercede earlier ones. In other words, if Mohammad first said “peace” and then he said “war,” the ONLY correct interpretation of the Qur’an MUST BE WAR. It’s different when it comes to a revelation from God, though: God isn’t supposed to be caught by surprise or change His mind with new information or be wrong and then correct Himself. How did Mohammad respond to this dilemma? It seems that Qur’an 2:106 was “revealed” in response to skepticism directed at Muhammad that Allah’s revelations were not entirely consistent over time. Muhammad’s rebuttal was that ”Allah is able to do all things” — even change his mind. In Surah 58, Al Mujadilah, verse 12, the believers are commanded to give alms before a private consultation with the Messenger. In verse 13 they are told that it is no longer necessary. In Surah 33, Al Ahzab, verses 50-51 Muhammad (p.b.u.h.) is allowed to marry and divorce an unlimited number of women. In verse 52 he is prohibited to continue to do so. In Surah 73, Al Muzzammil, verses 2-4, the prophet of Islam is commanded to spend about half of the night in prayer and reading of the Quran. In verse 20 of the same Surah this is changed into what is easy for him and those who followed his example. In every single example of violence in the Old Testament, it is ALWAYS in EVERY CASE a specific command by God to a specific people to do a specific thing at a specific time for a specific reason. There is NO universalized commandment by God to always kill everyone the way we see in the Qur’an, no “kill them wherever you find them.” There are no verses in the Bible that say “Fighting is prescribed for you, and ye dislike it. But it is possible that ye dislike a thing which is good for you…” (Qur’an 2:216), no “Those who believe fight in the cause of Allah” (Qur’an 4:76). God never gives a universal command that He later has to take back. If the Bible were given the same way the Qur’an is given, Moses would have commanded peace and Jesus would have come after Moses and subsequently taught, “But I tell you, hate your enemies and slaughter those who persecute you.” When Jesus, in fulfillment of the New Covenant that even the Old Covenant itself anticipated hundreds of years before Jesus’ arrival on earth, as the Prince of Peace, actually taught, “But I tell you, love your enemies and pray for those who persecute you” (Matthew 5:44). You need to comprehend how absolutely MASSIVE is the difference between a religion that begins with violence and then moves to peace (Christianity) verses a religion that begins with peace and then ends with commands to universalized violence. The Old Testament of the Holy Bible pointedly “abrogates” ITSELF in terms of violence because it promises a New Covenant and then it DELIVERS one in the form of the Prince of Peace, Jesus. The “abrogation” of violence was not for the sake of Jesus’ convenience, the way the abrogation of peace for a call to violence clearly was politically oh-so-very convenient for Mohammad. Let me put it this way: Jesus told Peter, “Put away your sword” (Matthew 26:52) in order that He could be arrested and beaten and go to the cross where He would die a terrible, humiliating, agonizing death in our place for our sins. Versus Mohammad who said let’s be peaceful when he was the underdog and then turned on a dime and ordered mass violence the moment his forces gained the upper hand. The Bible doesn’t “abrogate” violence merely because times had changed and the world was no longer a violent place and the Bible was correcting a problem that was obviously out of step with the rest of the world. Any such notion is simply FALSE. The Romans at the time of Christ were as vicious and brutal as ANYONE ever had been; what they did to Jesus itself proves that. And Jesus’ disciples wrote the New Testament not only in light of what Rome had done to Jesus, but in light of the fact that even as they were writing, Rome was treating Christians viciously. St. Peter and St. Paul were both executed by Rome, as were many other disciples. The God of the Bible is a God of wrath just as He is a God of love. But all of His attributes are perfectly balanced, such that His wrath is manifested in the attribute of justice that ultimately flows from love. And the toleration of evil results in a lack of justice. And so God gave His people the sword and used them as an instrument in defined, limited circumstances and only in accordance with His command. But ultimately He was always preparing for the arrival of His Son, the Prince of Peace. Finally, the thing that changed in the Bible was this: “But when the set time had fully come, God sent his Son, born of a woman, born under the law, to redeem those under the law, that we might receive adoption to sonship” (Galatians 4:4-5). God prophesied a coming Messiah who would epitomize and usher in a “new covenant,” and Jesus came as foretold. And so Jesus completely fulfilled the Old Covenant (Matthew 5:17). The various laws and regulations and customs of the Old Testament weren’t “abrogated,” but rather they were fulfilled and served their purpose and were no longer necessary because the promised Messiah took their burden off our necks. And so Christians have realized even in the time of St. Peter that unless a principle or a command from the Old Covenant is specifically repeated/restated in the New Covenant, it was fulfilled by Christ and no longer applies to New Covenant believers. We can compare the Old Covenant and the New to the abacus vs. the computer or the horse vs. the automobile: the former things weren’t “abrogated” and declared wrong; rather they served their purpose and we now use the superior things. Christ is the Superior which fulfilled the inferior and the inferior that served as a type or a shadow of the Superior (see for example Colossians 2:17, Hebrews 8:5) is therefore no longer needed. It is for this reason that I point out the fact and hereby state for the historical record that Penn State religious history professor Philip Jenkins is an abject moral idiot and the worst kind of intellectual fraud. He is, as are all progressive liberals, a pathologically ignorant fool masquerading himself as someone who is wise and knowledgeable when he in fact teaches the precise opposite of wisdom and knowledge. Jenkins is not only utterly blind to what is actually going on all around him in the real world as Muslim terrorists murder and bomb innocent people in the name of Allah, but as I have just proven he is just as utterly blind to the religious theology that he claims that he is an expert in. The fact that the Qur’an does NOT begin with violence and then end with peace, but rather the opposite, and the fact that abrogation forces true Muslims to accept that the later “revelations” to Mohammad supercede previous ones, puts Islam in a deep, dark pit of endless violence that is NOT true of Christianity. Which is why Christianity and Christ are attacked all the damn TIME by liberals and Christians don’t unleash waves of violent hate the way Muslims routinely do the moment they even THINK their Prophet might be getting insulted. We are left with a giant problem of Islam: we find that Islam, Mohammad and the Qur’an spent ten years deceiving people by preaching peace and tolerance in order to grow strong and powerful, and then the rest of history practicing force and violence and terror the moment they were able to gain the upper hand. We find that Islam does NOT mean “peace” as liberals love to adoringly say; it means “submission.” AND YOU WILL SUBMIT OR ELSE YOU WILL BE KILLED. A historical study of Mohammad’s life reveals that the “Prophet of Peace” had fought in over thirty violent military campaigns and had at least another thirty campaigns planned at the time of his death in 632 AD. In fact I can quote you Islamic sources that state, “that the Prophet waged jihad operations 77 times in the first 10 years as head of the Muslim community in Medina.” But it is a fact of history that when Mohammad showed up at Medina, he became a violent terrorist warmonger who waged unrelenting war until he defeated and subjugated everyone around him. What you will also find is that Islam did NOT practice peace after Mohammad’s death; in fact it split due to terrifying, graphic and vicious violence that continues to this very day as the viciousness created Sunni and Shiite Islam. But within 100 years of Mohammad’s death, warring, violent Muslims were attacking Christian Europe and had killed an looted and pillaged their way all across the entirety of Europe before finally being crushed by Charles “the Hammer” Martel at the Battle of Tours in France in 732. Preceding that, in the late 7th century, the most intolerant religion on earth built the Dome of the Rock directly on top of the most holy site of Judaism where the Jewish Temple had been built, where Abraham had been told to take his son Isaac as a sacrifice but God had provided a ram in place of Isaac. By then, violent warring Muslims had already poured across Africa and seized the Christian realms established by St. Augustine. All of the vast peaceful Christian provinces of North Africa had fallen to the bloody sword of Allah by 711. Violent, warring Muslims poured into Christian Spain to be finally defeated by El Cid. Violent, warring Muslims poured into the Christian Byzantine Empire and besieged Constantinople and the Christian Emperor pleaded with the Pope to send Christian warriors to defend a Christian realm from Muslim conquest in what became known as the Crusades. As we celebrate our Declaration of Independence – which contains obvious references to the God of the Christian Bible that the Democratic Party, Hillary Clinton and Barack Obama repudiate and dishonestly claims has no bearing upon our nation that Abraham Lincoln called “this nation, under God,” understand that uor Founding Fathers were still dealing with Islam when the Barbary Pirates were committing acts of terror against our ships and our sailors in the late 18th century. The Declaration of Independence could not put the case much more clearly: 1) God ordained man with certain rights; 2) to secure these God-ordained rights, governments are instituted among men; 3) any government that violates or usurps these God-ordained rights can be overthrown; 4) the king of England has indeed violated these God-ordained rights; and therefore 5) we are separating from England. And the Constitution that came after we successfully fought to separate from England proceeds to describe a government that does NOT violate the rights that God had ordained in mankind. At least until Democrats came along, murdered sixty million innocent human beings in a vicious and vile process known as “abortion” in which every single father has the right to the life of his very own child stripped from him. And homosexuality was erected in place of Christian morality and socialist human Government that has gone FAR BEYOND any damn thing the king of England ever did was imposed and worshiped in place of Christianity. You simply cannot take the Christian out of America and keep America. OR the Constitution that was itself based on morality and the true religion of Christianity. Our nation will collapse and our founding fathers understood that. And Democrats are traitors and fools for their pathological ignorance and frankly their pathological depravity. But I digress from my primary message that Democrats are demon-possessed whackjobs who rabidly despise reality and are literally saying that the ninety-five percent of terrorist attacks committed in the name of Allah by Muslims according to the teachings of the Qur’an according to the life example of Muhammad somehow have nothing whatsoever to do with Islam. Islam could NOT be more clear: kill your enemy. Kill him wherever you may find him. Any so-called “peaceful sura” was abrogated and replaced with the command to violently kill. Muhammad, the paradigm of Islam, proved that and demonstrated that and documented that in the blood of his victims throughout his wicked and vicious life. Please stop denying simple reality. If you want true peace, you turn to the religion that every single Democrat radically despises: biblical Christianity. Democrats, as I’ve said again and again and again, are “DEMOnic bureuaCRATS.” Democrats are demon-possessed worshipers of the human State that murders God’s babies to the tune of TEN TIMES MORE EVIL than the Nazi Holocaust while worshiping homosexual perversion as they strip away God’s ordained morality and replace it with immorality directly out of the depraved heart of the devil. And they actually do so claiming they are doing God’s work!!! 18 For the wrath of God is revealed from heaven against all ungodliness and unrighteousness of men who suppress the truth [a]in unrighteousness, 19 because that which is known about God is evident [b]within them; for God made it evident to them. 20 For since the creation of the world His invisible attributes, His eternal power and divine nature, have been clearly seen, being understood through what has been made, so that they are without excuse. 21 For even though they knew God, they did not [c]honor Him as God or give thanks, but they became futile in their speculations, and their foolish heart was darkened. 22 Professing to be wise, they became fools, 23 and exchanged the glory of the incorruptible God for an image in the form of corruptible man and of birds and four-footed animals and [d]crawling creatures. 24 Therefore God gave them over in the lusts of their hearts to impurity, so that their bodies would be dishonored among them. 25 For they exchanged the truth of God for [e]a lie, and worshiped and served the creature rather than the Creator, who is blessed [f]forever. Amen. 26 For this reason God gave them over to degrading passions; for their women exchanged the natural function for that which is [g]unnatural, 27 and in the same way also the men abandoned the natural function of the woman and burned in their desire toward one another, men with men committing [h]indecent acts and receiving in [i]their own persons the due penalty of their error. 28 And just as they did not see fit [j]to acknowledge God any longer, God gave them over to a depraved mind, to do those things which are not proper, 29 being filled with all unrighteousness, wickedness, greed, evil; full of envy, murder, strife, deceit, malice; they are gossips, 30 slanderers, [k]haters of God, insolent, arrogant, boastful, inventors of evil, disobedient to parents, 31 without understanding, untrustworthy, unloving, unmerciful; 32 and although they know the ordinance of God, that those who practice such things are worthy of death, they not only do the same, but also give hearty approval to those who practice them. Number one, if you are a Democrat, you suppress the truth in unrighteousness. That is what you are and that is what you do. Don’t tell me that isn’t a fundamental fact about the Democratic Party. Don’t tell me that Democrats have abandoned God as Creator. You have replaced the truth about a Creator God with godless evolution. You have replaced the truth that human beings are created from the womb in the image of a holy God and you have monstrously and wickedly replaced it with sixty million abortions. And as a result, what is SELF-EVIDENT, such as recognizing a Creator God, such as recognizing obvious reality about the nature of Islam and the nature of Islamic terrorism, is denied and rejected no matter how damned beyond obvious it is. And so every damn wicked thought you have is futile and false. And because of that, GOD HAS GIVEN YOUR PARTY OVER TO WICKEDNESS. It is amazing that every time in the Book of Romans that you see the phrase, “God gave them over,” you can trace the content of that phrase DIRECTLY to the Democratic Party platform. The Democratic Party is the Party that God gave over to wrath. For this reason God sends them a powerful delusion so that they will believe the lie. Stop believing the lie. Stop believing the Democratic Party when they tell you lie after lie after LIE.